RKO’s A GAME OF DEATH is a re-working of The Most Dangerous Game . John Loder is the hunter/writer who is the only survivor of a shipwreck.He swims ashore to an island owned by mysterious Edgar Barrier who is also a hunter. But he doesn’t reveal what his quarry is. Barrier has a habit of touching a scar on his forehead and playing the piano. Definitely maniacal! 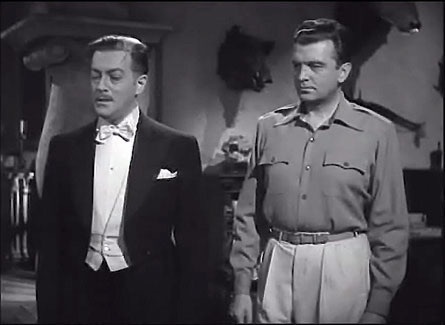 He even invites Loder to join him that evening, with Wade as the quarry. So the battle to survive begins. 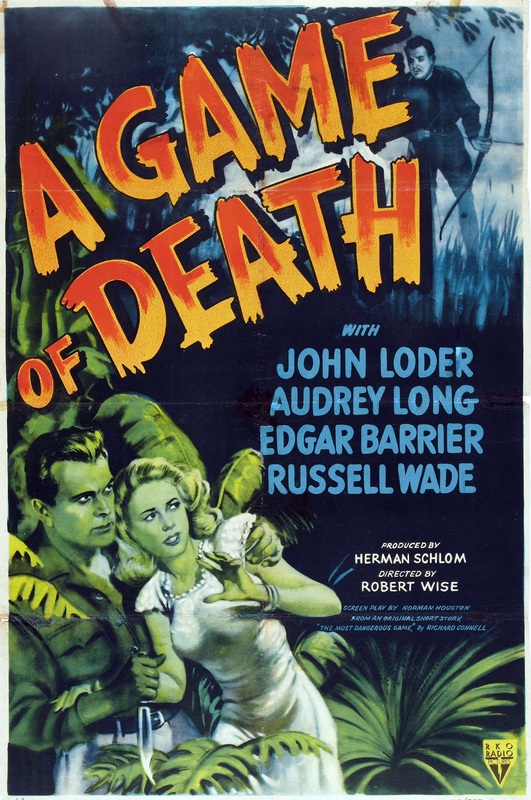 Director Robert Wise does the best he can with a limited budget which included using some shots from Most Dangerous Game. Shame on Columbia for making this film Lucille Ball’s last under her Columbia contract. Lucille is the unlikeliest Arabian princess and she isn’t even playing the lead. The nominal stars are John Agar (as the ‘Scarlet Falcon’) and Patricia Medina. 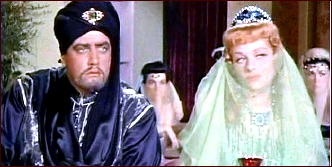 Lucille plays the sister of the villainous Sultan, with Raymond Burr in his usual role of bad guy. And there is a magic carpet. It was so bad, I gave up half way through. I can understand why this film is hardly ever mentioned. Lucille was 40 at the time – over the hill in Hollywood terms. I guess Lucille just wanted out of her contract – she had new career horizons ahead of her and only made a few more films after this one. The boarding house is run by wheel chair bound Anna Q Nilsson. Alice White is cute as an aspiring stunt woman, Peggy Ryan is a dancer who does a fair imitation of Ann Miller in You Cant Take It With You as she dances about the house while dusting the furniture! A young Cara Williams shows off her particular ability – imitating stars like Bette Davis and Mae West. The plot doesn’t amount to much but it’s fun. It was interesting to see Anna Q Nilsson,star of countless silent films. Alice White ,another silent star, almost steals the film with her comedy. Tiny Edith Fellows consistently played a sweet young girl in all her films. I don’t know why her film career wasn’t longer. Even if the budget is low I’d still very much like to see A GAME OF DEATH, for the sake of comparison if nothing else. Shall have a look around. Three very different movies! A Game of Death is certainly fun despite, as you say, the budget (or lack thereof). But I feel perversely inclined to give Girls’ Town a try. 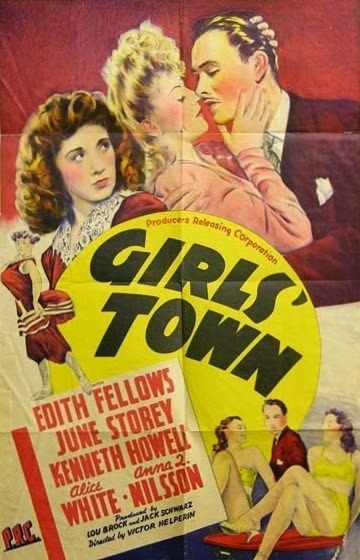 Girls’s Town is ok. It’s yet another film I had never heard of.